Another major/joint effort involves the development of a new ESRI product called **MapIt. **This technology provides simple geocoding and mapping capability for the Microsoft environment. MapIt enables developers to create maps of their enterprise data stored SQL Server 2008 and Excel. MapIt is designed to give non-GIS organizations the ability to easily create maps and share them within a variety of Microsoft environments like SharePoint. Details will be announced in July. There were rumors of such a product coming out at the DevSummit, but nothing came of it. This appears to be the continuation of the Silverlight/WPF product that ESRI has been working on. What is interesting here is it would appear not to be using ESRI Servers (ArcGIS Server/ArcSDE) and direct connecting to SQL Server then visualizing on Bing Maps. It would appear that you can develop using ESRI’s APIs, but not deal with ArcObjects. 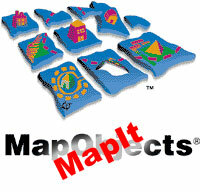 As an ESRI developer though, I’m wondering if this could be my new MapObjects? No word on pricing and licensing, but I’m going to be paying close attention to MapIt in two weeks.